For the first time in years, non-Korean players have a shot at the final. 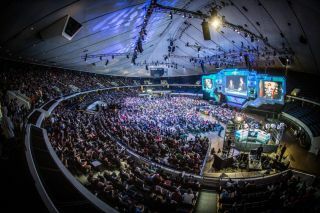 The biggest annual event for StarCraft II is just around the corner. The WCS Global Finals have already begun with group stage concluding last Sunday. The western scene continued to impress with stellar performances from Tobias ‘ShoWTimE’ Sieber, Alex ‘Neeblet’ Sunderhaft (the artist formerly known as ‘Neeb’), and Mikołaj ‘Elazer’ Ogonowski. These three ‘foreigners’ will represent the rest of the world against five Korean players in the top eight. Things had looked quite bleak initially, as Park ‘Dark’ Ryung Woo and Kim ‘Stats’ Dae Yeob eliminated two fan-favorite ‘foreigners’ from Group A, but the rest of the international lineup managed to turn things around. ShoWTimE put in the most impressive shift of the bunch. From a group with two GSL champions, ByuN and Dear, he advanced in first place with a perfect 4-0 scoreline, defeating both. Other group winners were Dark, Jun ‘TY’ Tae Yang, and Joo ‘Zest’ Sung Wook. ShoWTimE had suffered a small dip in form in the weeks leading up to the Global Finals, but seemed well up to the challenge. Now most eyes are on him. Entering a favorable bracket with the confidence earned in two huge victories, who knows how far ShoWTimE can go? Click here for more on Neeb's historic victory over South Korea last month. The American hope, Neeblet, continued to impress as well, but looked a lot more vulnerable in his preferred Protoss vs. Protoss match-up than he did at KeSPA Cup. Jo ‘Patience’ Ji Hyun took him to match-point twice, and a reinvigorated Zest finally defeated him. His quarterfinal opponent, Dark, was considered a tournament favorite by many before the tournament began, and has so far played to that standard. Neeblet’s Protoss vs. Zerg is largely untested. Two odd series at KeSPA Cup tell us very little about his current level in the match-up, and Dark is a step up from every Zerg Neeblet has played all year. Their match is perhaps the most intriguing of the entire quarterfinals. Perhaps the biggest surprise of the tournament came in the form of Elazer. Struggling to qualify for the Global Finals at all—he was tied with Kim ‘viOLet’ Dong Hwan, before two qualified players had to forfeit—the Polish Zerg delivered two of the biggest upsets of the tournament. Reigning Starleague Champion Solar was sent to the Losers’ Match by him before being eliminated, and Artur ‘Nerchio’ Bloch fell to Elazer in the deciding match of their group. Both were considered favorites to go far in the tournament, but Elazer had little trouble with either. As if the foreigners’ impressive performance was not enough, the quarterfinal bracket shows how kind the draw was to them as well. When the community was previously hoping for western representatives to reach the Round of 8 at all, they suddenly have their hopes set on one of them advancing as far as the Grand Finals. KeSPA Cup Champion Neeblet had declared Dark ‘not so scary’ just prior to the Quarterfinal draw and was promptly matched against him. All it takes for a western player to reach the Grand Finals is Neeblet following up on his own words. The lower bracket on the other hand is a Korean graveyard. Reigning GSL Champion ByuN was put in a hellish bracket against ex-KT Rolster’s dynamic trio of TY, Zest and Stats. Given how these three have played at the Global Finals thus far, that is a daunting task. He faces TY first in a match that Terran fans will be extremely torn over. They will be very glad to witness a TvT in a competition that began with only two Terrans and have one of them guaranteed in the Semifinals, but at the same time will have to say goodbye to the other. The three musKTeers (heh) won’t be happy with the bracket, either, for obvious, team-killing related reasons. One thing is for certain, though—whoever makes it to the finals from that side of the bracket is the favorite to lift the trophy come Saturday, simply by virtue of surviving against that opposition. GSL Season 1 Champion Zest looked in fine form again after a run of dodgy results throughout Season 2, despite dropping two maps. Against TRUE, whose aggressive playstyle had caught him unprepared in their second game, Zest pulled off a highly impressive defense in Game 3. On his way to topping Group B, he dealt Neeblet his first PvP series loss since August. Even though his scoreline is the weakest among the group winners, his performance was equal to theirs. Entering the tournament as one of the big favorites in both previous years, Zest disappointed at both. With three GSL titles, a KeSPA Cup, a Proleague victory and an IEM World Championship under his belt, Zest has essentially won everything else there is to win. BlizzCon is the only trophy missing from his stack. He will be aiming for nothing less, even if a victory would come at the expense of TY and Stats, his longtime friends and roommates. That lower bracket is, for enthusiasts of high level StarCraft, as interesting as the upper one. The Global Finals strive to round up to best players in the world and put them in one tournament. Any event would be lucky to have these four players in its Semifinals. TY and ByuN are the two best Terrans in the world, and Zest and Stats are arguably the two best Protoss. Put any one of them in the Grand Finals and you’re set for a series played at the highest level. But we shouldn’t be surprised about that. BlizzCon is where these titans of StarCraft II come out to play. That is what we’ve come to expect from the Global Finals. This lineup of players, these results, and this draw all promise one thing: you will not be bored this weekend.